Foreign Correspondents Club of Japan, No.1 Shimbun, September 2011. When I first got here in the mid-1980s, at the start of Japan’s bubble era, non-Japanese (NJ) were seen as quirky “misunderstood outsiders,” treated with bemusement for their inability to understand “Japan’s unique culture.” NJ were here to help Japan learn English and internationalize itself into its hard-earned echelon as a rich country in the international community. After all, Japan had just surpassed the per-capita gross domestic product of its mentor – the United States – so the media was preparing the public for Japan’s new role as oriental ambassador to the West. Up in Sapporo, where I have spent most of my time, designs for NJ were a little less heady, but we were then treated like “honored guests” (if not “rare birds” to be sighted with joy). We enjoyed instant comparative-culture ambassador status, complete with token slots in newspapers and talk shows, to offer bright visions of Japan’s modern, tolerant, America-ish future (like the guest instructors who were brought over to modernize Japan during the “catch-up” phase of the Meiji Era). The local print and broadcast media offered us polite winces for our error-filled (and perpetually uncorrected – so darn cute!) Japanese, and we tolerated wasabi-laden food in front of the cameras. However, the tacit understanding behind this century-old ersatz cultural ambassadorship is that ambassadors are temporary. Someday we would go home with the afterglow of pleasant memories, as a former guest of a faraway land with red lanterns and paper walls and all that. But that didn’t happen. Over a million NJ, your correspondent included, liked it here so much they stayed on. Then Japan’s bubble economy burst in the 1990s. As economic indicators plateaued then headed south, the media mood subtly shifted. Perennially feel-good broadcasts (I remember one TV show entitled “Sports and News” – yes in that order) shifted to programs dedicated to “turning that frown upside down”; when they ran out of good news to report, they switched more to comedy and food shows. Fortunately, these NJ media guests were still the “misunderstood outsiders,” only this time more as curiosities to be examined under Japan’s “pigeonhole everyone in cultural boxes” version of social science (visible in broadcasts such as “Koko Ga Hendayo Nihonjin,” a watershed show that pitted 100 motley Japanese-speaking NJ panelists against several even more motley Japanese tarento). This time, however, thanks to new visa regimes importing cheap NJ labor to preserve the competitiveness of Japan’s export industries (and keep farms and smaller factories from going bankrupt), NJ were now more culturally and linguistically fluent. They were beginning to speak for themselves, shape their own media image, and even possibly establish themselves as immigrants. But by the turn of the century, Japanese conservatives began to use the media to put the kibosh on. The next phase, which has essentially continued to the present day, overtly began on April 9, 2000, when recently elected archconservative Tokyo Gov. Shintaro Ishihara made his famous “Sangokujin” speech. He claimed that some NJ were “repeatedly committing heinous crimes,” and called for the Self-Defense Forces to round up NJ in the event of a natural disaster as they would (unprecedentedly) riot. Even in light of the Tohoku disasters, where this has been proven as utterly false, there has been no amendment or retraction. But this speech emboldened Japan’s reactionaries (particularly its police, fortified by its new internal “Policymaking Committee Against Internationalization”) to see rampant NJ bashing as politically viable. The established media was exceptionally compliant in disseminating this propaganda. They reported NPA crime announcements verbatim as writ, without analysis of the faulty claims and flawed statistics (e.g., reporting NJ crimes separately, however small, and as percentages – not as raw numbers – and without any contextual comparison with crimes committed by Japanese). By the end of the decade, the media was bending over backwards to criminalize NJ. Even when overall NJ crime declined, newspapers pinpointed selective crime rises, headlined crime falls in their English articles while marking it out as a rise in the same Japanese article, or manufactured news on the prospect of NJ crime rises. Have things improved since March 11? I would argue not. In March and April, Japanese media bashed NJ afresh. Despite foreign governments issuing advisories for their citizens to take evasive action during the disasters (which overseas Japanese in the same position would have followed), NJ were blamed for cravenly running away, deserting their posts (remember the “flyjin,” rendered in Japanese as nihon o saru gaikokujin?) and looting. Once again, there was no comparison with AWOL Japanese, and no questioning of Ishihara’s 2000 prediction that foreigners would run amok. Predictably, that frenzy has died down, and some media outlets have reported on the volunteerism and generosity of NJ in relief efforts. But in the end, I believe that NJ will get at most a token expression of gratitude (as I did from the Kobe Government – a “thanks” sticker that I treasure – for going down and helping out during the 1995 quake), but not what they really need – a consistent, national-level public recognition of their longstanding contributions to Japanese society. Good timing with this article. I was going to post this in your thread from a few years back dealing with how to deal with rudeness/racism from kids, but since I see the media as the cause, this seems more appropriate. I am an ALT, so there is a certain amount of nonsense I have to put up with. This includes the Japanese with a fake accent. Unfortunately, TV seems to give the kids open licence to do this – after all, if it’s on TV it can’t be wrong. * An ad for a certain conversation school (the last of the “Big 3”?) featuring obnoxious kid using fake-accented Japanese to pass off as English. * An ad for a laundry detergent featuring a blond woman clearly auditioned for her inability to speak Japanese, complete with childish calligraphy on the hikkoshisoba she’s giving to her new neighbours. * An ad for a sattelite TV broadcaster, with a Japanese speaker doing fake accents of a certain soccer player’s name. * Yet another laundry detergent ad, this time with a white woman with HUGE nose, and dubbed with fake accents again. The basic messages these ads a sending. * NJs can’t speak Japanese correctly. * Fake-accented Japanese is perfectly fine instead of English. * Using these fake accents is acceptable when dealing with an NJ. How about a little more responsibility in the media? What happened to omoiyari? I’d love to see how the mainstream media would react if the shoe was on the other foot. — You can. How about the atomic bomb joke in Britain last January? Well, okay, that’s not about accents, but it’s still about claims of insensitivity passed off as humor. 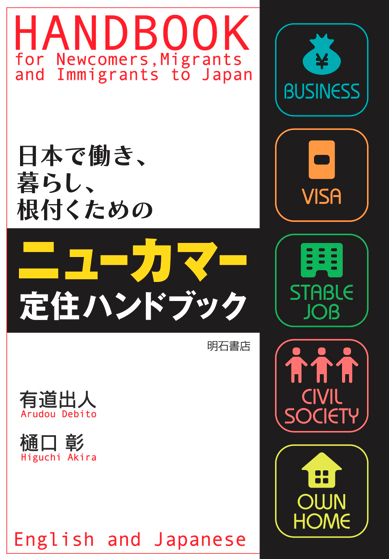 What role do you believe that the overall monoglot nature of Japanese society plays? For a very wealthy country, that uses a language that no other country uses, Japanese are remarkably monoglot. 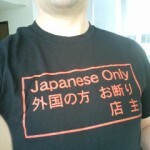 Does their inability to fruitfully access or use any other language affect their essentially bigoted view of all non-Japanese? And, does their failure to effectively teach any foreign language to the bulk of their populace reflect the bias that you describe? Additionally, do you believe that that bias varies among varies Japanese demographic subgroups? Many people would LOVE a Van Gogh in their living room. Nobody would EVER want Van Gogh himself in their living room. — Tell us how, please. More links like these will not be approved, sorry. I don’t know about other English schools or public schools, but in my classes we punish the use of “nee HOWN gow” instead of English. I gave a presentation once to an “international society” where I raised the issue of political correctness, specifically how Japan needs more of it, and people seemed receptive. And I don’t mean in a “the foreigner says this is the way they do things in foreigner-land”, but they seemed to respond positively to the idea that the media shouldn’t stigmatize minorities. Thank you once again for articulating the social history of the changing way Japanese society view NJs with meaningful dates and events. It is what I have often thought and felt (but thought it was just that, just my feeling how it had “changed” since the 80s), but could not quite assemble coherently with dates and names. Now you have put it into words, we can all know that it was not just purely in our minds, and we were not going insane. I enjoyed reading Crustpunkers article on ethrocentrism. I would like to know if there has been any study done on the long term effects one foriegners, NJ or Naturalized, who have lived in this type of homogenous soto / uchi enviroment. In this land first get JG to change it’s tunes, then the police to change their policies, then the media will change it’s tune. Remember the Japanese media is not as strong and assertive as that in most western countries. So when they want to sell news they have to go after the soft targets: NJ. Debito, how can you write an article this long and not once call Ishihara et al. for what they are: racists? We need to get that meme out there. I think Crustpunkers link is relevant in that the research described by it shows that even Japanese who have had ‘cross cultural experiences’ score (on the GENE system) as being more ethnocentric than their US counterparts. The author puts forward the theory that having lost the war ‘cultural superiority’ has replaced ‘racial superiority’ as the basis for discrimination against ‘gaijin’. I would agree with that conclusion. — Fine. I’m not disputing the relevancy. I’m asking, as I’ve asked for years now, for commenters to tell us why in a nutshell we should be reading a link they recommend. Make the relevancy clear themselves. Just sending us a link with no summary is lazy. Sorry, I would have explained the relevance of the link but was on the move and wanted to post it before I left the computer I was at and the link got lost. In the future will provide a more comprehensive reason why links are relative. As Jim points out though, One of the parts I also found most interesting was the theory about “cultural superiority” replacing “racial superiority” in post war Japan. Thought was a pretty bold statement to make and was wondering how others might respond to that one in particular. Is it possible that Western individuals who come from countries that have traditionally incorporated larger cultural diversity in their society are much more sensitive to ethnocentric behaviours to the point that they see it as racism/discrimination? 1)A strong belief in the surperiority of all other group’s cultural heritage (history, values, language, traditions, arts/crafts, etc. 4)Manifestation in Institutions. For example, education systems, management systems. If you want to spend a shitload of money to read what else they have to say be my guest and buy this from Amazon, but this is a good “choice” oft-quoted section that relates to the topic at hand. Currently I am looking to see if there has been any follow up research by the author of the original paper I linked to (or anyone)on the topic. If found, will post. I do not believe there to be any difference. However, it is more socially acceptable to say that one is ethnocentric rather than racist. And Japan, which fastidiously denies any of its culpability for crimes committed during World War 2, likes to rely on the notion that it has been the victim of racism, rather than the aggressive promoted of racism. For example, I was amused to see on NHK that on 9/11 there were a few shows on how the USA interned ethnic Japanese during World War 2 — thereby creating a type of moral equivalence between the USA as a victim of violence, and Jaopanese as victims of US violence. Similarly, every year during the anniversaries of the atomic bombings, there are endless commemorations that have as an axiomatic belief that the bombings were wrong and war crimes, and many state that the Japanese were victims of racism through the bombings. Yet, are there EVER any meaningful airings of the fact that the Japanese were working also to create an atomic bomb? Can one doubt that the Japanese government would have used such a bomb had it been in possession of one? And, are there real meaningful discussions nationwide of the crimes that the Japanese government committed throughout Asia during that period? Moreover, the secrecy of Japan and its government, to this day regarding such historical facts is tied, I believe, to its ongoing inability to be honest with its own citizens regarding a large variety of issues, including Fukushima. — I’ll approve this comment, but this blog topic is not about Japanese racism in general. It is about J media treatment of NJ. Let’s address this as well in future posts. But what the NPA couldn’t foresee was the popularity of the internet and the rise of sites like YouTube. Fight misinformation with information. People don’t need to get their news from traditional news media anymore. More and more people are standing up for their rights, even standing up against oppressive governments, thanks to the internet. The truth wants to get out. I see a Japan that will become less popular even with its own people. Japanese media treatment of non-Japanese arises organically from the Japanese journalists themselves. These journalists are not acting under compulsion. In other words, the issue is not that somehow the media represent and promulgate a viewpoint alien to society. Rather, I believe, the media in this case merely reflect societal sentiments. Well, for one thing, Japanese media employees, with exceptions that are chiefly clustered amongst foreign correspondents abroad, show little interest in the non-Japanese world. One expression of this I see in their non-command of foreign languages. In Finland or Netherlands (also wealthy countries that speak a language used virtually nowhere else), domestically focused journalists generally do have a strong command of a widely used foreign language, because as journalists they actually have an interest in current events, and know that current events do not stop and start at their own borders. In other words, their is a self-selection bias among journalists in those 2 countries (and others) towards those individuals who are interested in examining how social forces play on events, and how events shape social forces. A virtually entirely monoglot corps of Japanese correspondents clearly cannot view any original sources, (whether they be media sources, governmental sources, or others) from abroad. And yet Japan is an island nation very dependent on, and involved with the world outside Japan. So, Japanese journalists are unable to discharge well the very profession into which they freely and voluntarily entered. In short, I think the confining this issue to that of the Japanese media treatment of non-Japanese is overly restrictive. The real question is about average Japanese treatment and perception of non-Japanese. Japanese journalists are drawn from the same well as their fellow non-journalists. As such, their views seem to roughly mirror those of non-journalists. — Just to take exception with your theory (which holds some water but IMHO an insufficient amount): Clearly you haven’t met too many Japanese journalists. I have. And they are some of the most cosmopolitan (and multilingual) people I’ve met in Japan. I’ve seen drafts of their stories reporting on internationalization shot down or transmuted beyond repair by closed-minded editors. You’re also ignoring the Kisha Club system and the need for the body politic to manufacture public consent through the media. This happens to a certain degree in all societies. My essay was on what kind of “public consent” they were manufacturing. Chicken-and-egg arguments, perhaps, but as I said in my essay the J media once did better on allowing views supporting kokusaika through. They don’t now. Why’s that? Because in my view a conservative “reverse course” took effect less due to ground-up influences but rather top-down pressures. We will probably have to wait a little longer to see how and if Japanese media attitudes have changed at all since March 11. Some might argue that the increase in Korean soapies is a positive indicator of a more NJ-friendly media, but others say that it’s purely a matter of economics – it’s cheaper to import the programs and dub than it is to make originals, plus it’s cashing in on the current fad of Korean idol groups. The acid test will be the NPA crime statistics and how similar crimes committed by Japanese and NJs are covered. the logical question then focuses on Japanese editors. Regarding the waxing and waning of kokusaika, that is a very big topic. One that I believe is also tied incidentally to the fact of a monoglot Japan. As you say, Japan is a very top-down culture, and in many ways a very undemocratic democracy. However, back to the point (as I ramble), Japanese editors seem to be rather influenced by non-editorial considerations. If that is so, then the tenor of Japanese society, and its hostility and indifference towards non-Japanese, are likely to be among such influences. I believe that the failures of Japanese journalism are reflections of the broader failure of Japanese society to view itself an an integral element within a broader international society. I’ve been out of country for a while, so I’m not sure how the media landscape has changed since Japan began to switch to digital-satellite system for network broadcasting a few years ago. When I was back in Tokyo, I’ve just found several cable network news media available to the viewers. I didn’t have an opportunity to see how these independent/alternative media can differ from conventional media (i.e., NHK, NIHON-TV, TBS, TV-Asahi, etc.) in terms of framing news agenda from a distinctive perspective. I am hoping that such alternative media could attract many viewers at local/community-based level if they are capable of proving a better, professional journalism regarding the issue. But, I don’t know. It’s anybody’s guess. Regarding the issue, I reckon that it connotes Noam Chomsky’s “Manufacturing Consent”(1989), and addresses the decline of professional journalism due to state/institutional control of media corporations. Crisis of J-media is, I guess, indeed grounded on Walter Lippman’s political narratives on media “Public Opinion”(1922).